Henn na Hotel Huis Ten Bosch is a hotel project by Huis Ten Bosch Co., Ltd., with the goal of creating a low-cost hotel (LCH). The hotel project began in late 2012. Since the company opened the hotel in July 2015, they have conducted many substantial experiments in the business. As of February 2018, the LCH business is expanding its market. According to Takeyoshi Oe, the General Manager of Henn na Hotel Huis Ten Bosch, the important insights gained through the development of an LCH are to cut labor costs by introducing technologies such as robots and automation, provide uniform quality of service to hotel guests by making robots the main staff, and attract the attention of media and hotel guests with technologies that can be seen as entertainment. In 2010, H.I.S. Co., Ltd., a major travel agency in Japan, committed to managing the reconstruction of Huis Ten Bosch Co., Ltd. The company, located in a rural area in Kyushu, operates a theme park that emulates a Dutch streetscape. Hideo Sawada, the head of H.I.S. Co., Ltd. became the head of Huis Ten Bosch Co., Ltd. in 2010 and reformed the business in diverse ways. A typical problem in Japanese rural areas is the labor shortage caused by the concentration of young people in urban areas. When Sawada stayed at Hotel Europe, which is Huis Ten Bosch’s official hotel in the park, he noticed many services in the hotel that are costly, such as the presence of a doorman. At this point, he came up with the idea to create low-cost hotels (LCHs) to complement the conventional hotels, similar to the role of low-cost carriers (LCCs) in the airline industry. To successfully create LCHs, a project was launched to reduce the labor and utility costs of Huis Ten Bosch’s official park hotels as much as possible by using what were considered cutting-edge technologies at the time. However, building such a hotel facility immediately has high risk. For this reason, the company conducted an experiment in 2013 to build and test a house-type facility called a smart house. Sawada decided to actually live in the smart house for a month to judge whether a low-cost hotel service is worth providing to his customers on the basis of the smart house experiment. In November 2014, the construction of the East Arm, which is the primary building and has 72 guest rooms, began. After that, Henn na Hotel Huis Ten Bosch was opened in July 2015. The notable processes to create the LCH in Huis Ten Bosch were: giving it a unique name, introducing cutting-edge technologies to the hotel business, and improving it through trial and error. Regarding the first point, the name “Henn na Hotel” was chosen through a top-down decision. 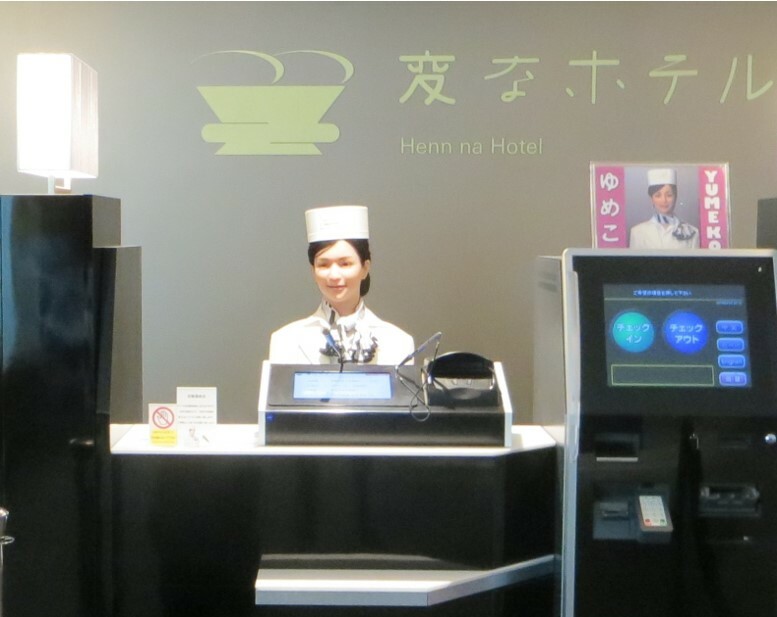 The company chose this Japanese name with a meaning of “a commitment to evolution.” The Japanese adjective “henn na” also has the general meaning of “strange.” Regarding the second point, the company attempted to replace the receptionists, bellmen, cloakroom attendants, and cleaning staff in the hotel with robots. To do so, they first tried to make appointments with companies that seemed to have the capability to make the robots they wanted. However, in the start-up stage of the project, it was difficult to arrange this sort of appointment due to the unique name. The company narrowly succeeded in contracting with several suitable companies. Finally, they also tried introducing new and unique approaches in the actual hotel business in order to reduce the labor and utility costs. For example, the company put two robots in the reception area. One was an android robot with a woman appearance, the other was a zooid robot with a dinosaur appearance, particularly designed for amusement, giving the nod to the hotel’s theme park location. In the guest rooms, there were no TVs or refrigerators, but there was a voice-activated companion robot, which was the first step to replacing a hotel concierge with a robot. For the hotel booking, they implemented an auction system. 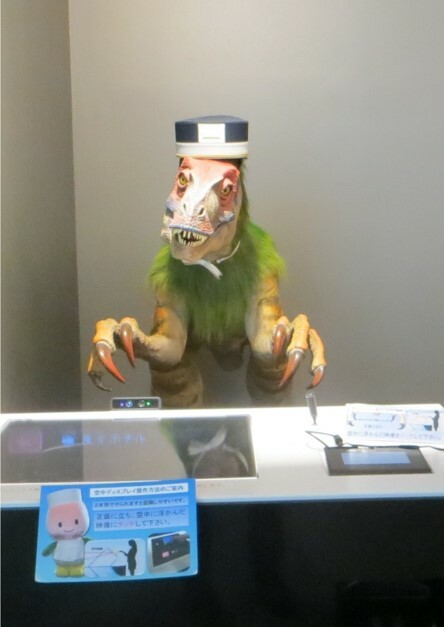 However, in July of 2015, which was the opening month of the hotel, their guests strongly complained about the radical cost-cutting, the unique booking system, and the voice-activated robot. The staff of the hotel modified the business on the basis of the customers' opinions. For example, they equipped the rooms with TVs and refrigerators, ended the booking auction system, and adjusted the voice-activated robot to serve children. In Henn na Hotel Huis Ten Bosch, the business model was improved on the basis of trial and error. As of February 2018, the important insights gained through the diversified approaches to developing the Henn na Hotel Huis Ten Bosch LCH are as follows. 1) Cutting down on labor costs by introducing technologies such as robots. In the beginning of the business, there were 72 guest rooms and 30 employees. Currently, there are 144 guest rooms and 7 employees thanks to the robots and the automation of the hotel services that they enabled. However, General Manager Oe noted that, taking potential circumstances such as the sudden illness of a customer into consideration, this number of employees is close to the feasible minimum. 2) Providing uniform quality of service to hotel guests by making robots the main staff. In human-to-human services, the service quality varies depending on the employees’ physical conditions, customers’ attitudes toward the services they receive, differences in customers’ native languages, and so on. If a robot provides service, the service quality is the same for any kind of guest, given adjustments for different languages. 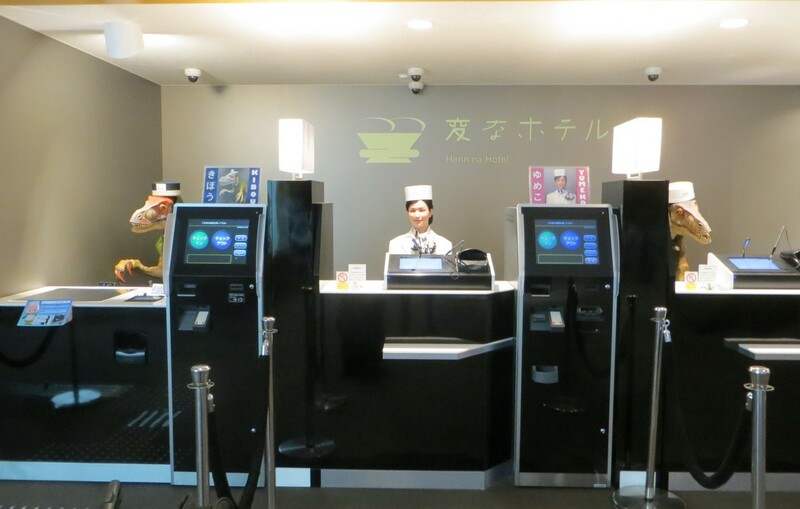 Although the service quality itself is average, this sort of robot-provided service is relatively preferred by foreign guests. Additionally, some Japanese guests who do not want to be bothered by human interactions prefer this robot-provided service. 3) Attracting the attention of media and hotel guests with technologies that can be seen as entertainment. As of February 2018, the LCH business is expanding into major cities in Japan and other nations in Asia. Looking back on the path to the creation of Henn na Hotel, General Manager Oe explains that the name of the hotel enabled it to overcome a number of failures. “Henn” has two meanings. One is “change,” including the nuance of “evolution.” The other meaning is “strange.” Japanese people who encountered something inconvenient or poorly-managed because of the robot-oriented nature of the facility tended to tolerate it, thinking, “I don't blame the robots, and besides, the hotel has ‘strange’ in its name.” Agility-oriented management involved in this sort of substantiating experiment runs the risk of providing insufficient service to customers. In a way, Henn na Hotel can be thought to have overcome this risk with its name. The general manager also has plans to develop new hotel and robot services and to continue to explore the “henn na” LCH. [i] This article is based on an interview with the General Manager of Henn na Hotel Huis Ten Bosch, Takeyoshi Oe (Huis Ten Bosch Co., Ltd.), conducted at Henn na Hotel Huis Ten Bosch on February 23, 2018. [ii] According to his keynote speech in “Jissen Solution Fair 2018,” held by Otsuka Corporation in Tokyo on February 8, 2018.